even though we are not vegetarians, we often make a lot of vegetarian recipes. however, we don't tend to make many vegan recipes. one of my goals for the new year is to see if i can start cooking/eating a bit more vegan. it's all about balance in life. i can eat my weight in chicken parm, so i have to find ways to balance that out. you know how it is. we just love breakfast at our house. we eat cereal every morning on weekdays, so weekends are all about fun breakfasts. we are pancake and waffle fanatics! 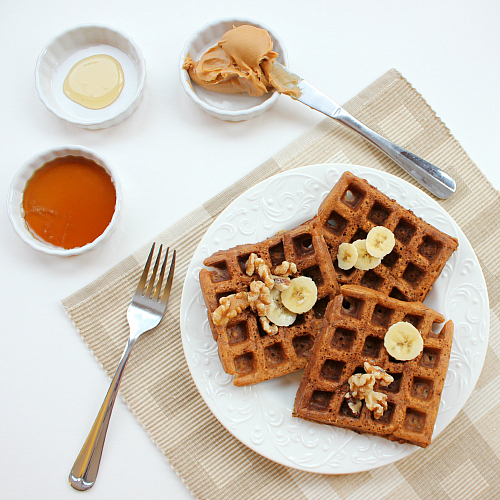 on saturday morning, we made banana walnut waffles. i'll let you in on a little secret about these waffles . . . they're vegan! cooking vegan seems so difficult at first, but really it's all about finding the right substitutions. if you do it right, you won't even know that a recipe is vegan. that's exactly the case with these waffles. you won't find any milk, eggs, or butter in this recipe. we used almond milk in place of milk (of course, you could use soy milk or rice milk too) and we used oil in place of butter. these waffles turned out so good. they don't look vegan, and they certainly don't taste vegan. they actually tasted just like banana bread. the ripe banana and the chopped walnuts gave them such a great flavor. there is a hit of cinnamon in them and a dash of pure maple syrup too. such a great combination. this recipe made plenty of waffles, so we had some left over. it's just wonderful to have leftovers, we're big fans of leftovers in our house. we stored them in the refrigerator in ziploc bags and then reheated them in the toaster when we were ready to eat them again. 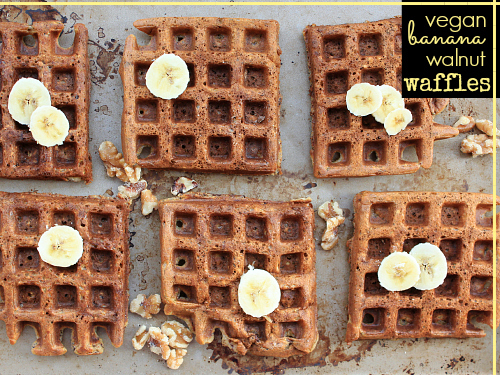 you could freeze the leftover waffles too and then reheat them in a toaster or toaster oven. talk about a great toaster breakfast! preheat your waffle iron according to the manufacturer's instructions. in a small bowl, combine the almond milk, water, and vinegar. stir and then set aside to allow the milk to curdle. in a separate bowl, mash the bananas. add the curdled almond milk mixture along with the oil, maple syrup, and vanilla. stir well to combine. add the flour, baking soda, baking powder, and cinnamon. stir just until combined, then fold in the chopped walnuts. pour enough batter into the waffle iron to just barely cover the waffle grid (usually about 1/2 cup of batter per waffle). cook for 4-5 minutes, or until the waffles are golden brown. once cooked, transfer the waffles to a baking sheet and keep them in a warm oven while you prepare the remaining waffles. serve hot with sliced bananas, additional walnuts, peanut butter, honey, and/or maple syrup. Looks yummy! Lisa is vegan and many of the foods at my shower were vegan (and one of the cupcake choices at the wedding)! If you ever have any questions about vegan subsitutions just ask me or her- I've gotten quite good at taking any recipe and transforming it into a vegan masterpiece! Look like the waffles would have lots of flavor. Will have to try them.